The Model M106 Electrochemical Quartz Crystal Microbalance is an extremely sensitive instrument for precision measurement of very small mass changes in the ranges from 1 ng to 100 ug. 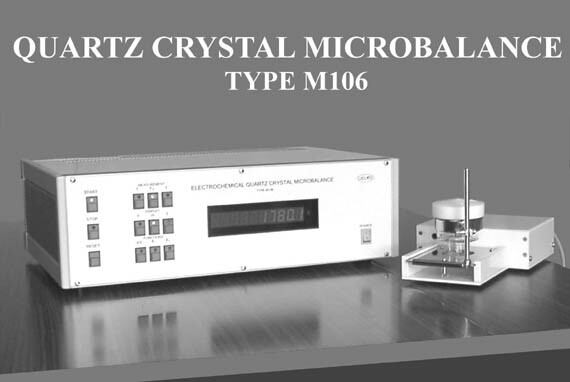 Quartz Crystal Microbalance M106 consists of two basic units: Oscillator unit and Central unit. The task of Oscillator unit is to record the frequency changes of quartz crystal, which is coupled with measuring oscillator. The oscillation frequency changes with any change of mass rigidly attached to the metal electrode (gold or platinum) evaporated on the quartz surface. The frequency change is measured by the instrument and converted to the mass units. The crystal is attached to the bottom of an electrochemical cell using a silicone - rubber. The cell is placed into a holder, which is connected to easily changed insert. In this way fast replacement of the crystal is possible (it takes seconds). One of two electrodes present on opposite faces of the quartz crystal, which has contact with solution, is the working electrode (WE). The instrument uses the AT-cut 10 MHz quartz crystals 14 mm in diameter. Model M106 EQCM measures changes of frequency using two methods: interval measurements (fast) and classic (one second) method. An internal computer translates interval measurements to frequency and then both values to mass change. Before the start of measurements the instrument performs automatic tests of crystal in order to make the measurements more precisely. Compatible with any potentiostat thanks to two measuring channels X and Y with analog to digital conversion. Compatible with any potentiostat having an analog input and with any analog plotter. PC remote operation via RS-232 interface. Range of frequency change 0 - 100 kHz.